If you're looking for a great (and cheap!) hotel in Seattle, CheapTickets is the best place to find them. We offer deals on the best 492 hotels throughout Seattle. No matter what you're looking for, we have options for you. Grab great rates on the 180 affordable 3-star hotels that are easy on the wallet without sacrificing comfort. Looking for more luxury? Try one of the 70, 4-star hotel accommodations in Seattle. No matter your budget needs, we've pulled out all the stops to make sure you have plenty of vacation options. Maybe you prefer to search for your hotel deals based on what each hotel offers? For example, let's say you just want to find a hotel or resort that has a pool to cool off in after a long day exploring Seattle. Scroll down to choose from the 187 hotels in Seattle that has a pool for guests. Or search for deals on Seattle hotels offering free wifi or breakfast, non-smoking rooms, and more! CheapTickets is here to be your personal travel agent for your next trip to Seattle. Get booking today! What hotels in Seattle offer free wifi access? Are there deals on Seattle hotels offering free breakfast? Yes! The only thing better than finding a great deal on a cheap hotel in Seattle is finding one that offers free breakfast. Grab some eggs, a waffle, or some healthy oatmeal before a day full of exploring Seattle and all that it has to offer. Below are just some of the many hotels that offer free breakfast in Seattle. The Westin Seattle is a 4.00 star rated hotel property in Seattle that offers free breakfast. Sheraton Seattle Hotel is a 4.00 star rated hotel property in Seattle that offers free breakfast. 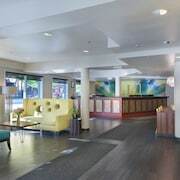 Staypineapple at Hotel FIVE is a 3.50 star rated hotel property in Seattle that offers free breakfast. 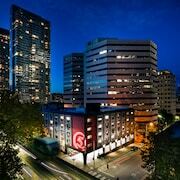 MarQueen Hotel is a 3.50 star rated hotel property in Seattle that offers free breakfast. What about deals on pet-friendly hotels in Seattle? Seattle is a great place to get outside and explore with your pets in tow so don't leave your furry friends behind. Below you'll find great deals on hotels in Seattle that allow pets. Don't forget to bring plenty of treats! Cedarbrook Lodge is a popular, pet-friendly, 4.00 star hotel in Seattle. 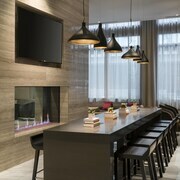 Hyatt At Olive 8 is a popular, pet-friendly, 4.00 star hotel in Seattle. 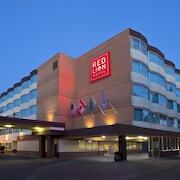 Red Lion Inn & Suites Kent Seattle Area is a popular, pet-friendly, 2.50 star hotel in Seattle. 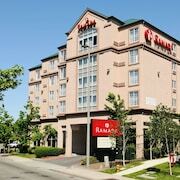 Americas Best Value Airport Inn is a popular, pet-friendly, 2.00 star hotel in Seattle. Any good rates on Seattle hotels with restaurants? Absolutely. Don't want to deal with planning our all your meals on your trip to Seattle? We don't blame you. Keep the hangry away by staying in one of the 95 hotels that have restaurants. With a room at one of these spots, all it takes to get a good meal is hopping in the elevator. Check out some of the most popular hotels in Seattle that have restaurants below. Book Grand Hyatt SeattleGrand Hyatt Seattle is a 4.00 star hotel and has one or more restaurant options. 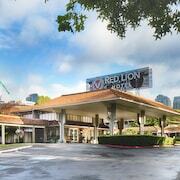 Book Red Lion Hotel Seattle AirportRed Lion Hotel Seattle Airport is a 3.00 star hotel and has one or more restaurant options. Book Staypineapple at The Maxwell HotelStaypineapple at The Maxwell Hotel is a 3.50 star hotel and has one or more restaurant options. What are the cheapest hotels in Seattle with pools? What's better after a long day exploring Seattle then a relaxing dip in a pool? Finding the Seattle hotel you need for a bargain! Cool off and unwind at one of our 187 Seattle hotels with a pool. Browse some of the top deals on these hotels and resorts with pools in Seattle below, but be warned: You may not want to check out! 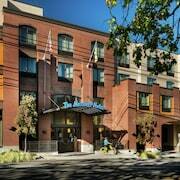 Extended Stay America Seattle - Northgate has a pool and a 2.50 star rating. Coast Gateway Hotel has a pool and a 3.50 star rating. Loews Hotel 1000 Seattle has a pool and a 4.50 star rating. Mediterranean Inn has a pool and a 3.00 star rating. What hotels in Seattle offer parking for guests? Once you've made your way to Seattle, the last thing you want to deal with is finding parking close to your hotel. Avoid the hassle of parking around the block and carrying your luggage all the way to the lobby by booking one of our hotels with parking. Check out deals on some of the 228 hotels in Seattle that offer parking for guests. Staypineapple at Watertown Hotel This hotel has a 3.50-star rating. Motif Seattle This hotel has a 4.00-star rating. Red Roof Inn Seattle Airport - SEATAC This hotel has a 2.00-star rating. Travelodge by Wyndham Seattle By The Space Needle This hotel has a 2.00-star rating. Do Seattle hotels offer 24-hour concierge services? When you're on vacation, things don't always go according to plan. Travel with peace of mind when you book one of our 75 hotels in Seattle with 24-hour concierge service. That way you know help is always phone call or elevator ride away. Try Seattle Marriott Bellevue. It's a 4.00 star rated hotel in Seattle that offers concierge services 24 hours a day. Try The Westin Bellevue. 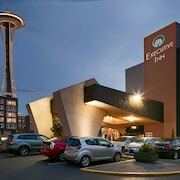 It's a 4.00 star rated hotel in Seattle that offers concierge services 24 hours a day. Try Hotel Max. It's a 3.50 star rated hotel in Seattle that offers concierge services 24 hours a day. Try The Paramount Hotel. It's a 3.50 star rated hotel in Seattle that offers concierge services 24 hours a day. What about low rates on non-smoking hotels in Seattle? Larkspur Landing Bellevue - An All-Suite Hotel This hotel has a 3.00-star rating. The Paramount Hotel This hotel has a 3.50-star rating. Pan Pacific Seattle This hotel has a 4.00-star rating. DoubleTree by Hilton Seattle Airport This hotel has a 3.50-star rating. What are the cheapest Seattle 3-star hotel deals? Our 3-star hotels bring you quality accommodations at a lower price point for the perfect, budget-friendly vacation in Seattle. With 180 3-star hotels throughout Seattle to choose from, you still have options. Browse our selection below. Mediterranean Inn. Set in the Lower Queen Anne neighborhood, this hotel is 2 blocks from Seattle Center and 1 mile from Pike Place Market and downtown Seattle. Terminal 91 Cruise Facility is 1.5 miles from the hotel. Staypineapple at Hotel FIVE. Featuring a funky, modern style, this Seattle hotel is in the hip Belltown neighborhood,5 blocks from Pacific Place and Westlake Center shops. The Space Needle, Experience Music Project, and Pacific Science Center are within 6 blocks. Executive Hotel Pacific. 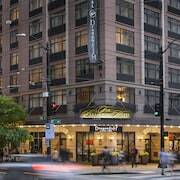 Located in Seattle's financial district since 1928, Executive Hotel Pacific is a 5-minute walk from the waterfront. Guests can stroll to Pike Place Market in 10 minutes to watch fish vendors flinging salmon, and to the Space Needle in 7. Washington State Convention Center is 3 minutes away by cab. Staypineapple at The Maxwell Hotel. Located in Queen Anne, this boutique hotel is steps from Pacific Northwest Ballet and Marion Oliver McCaw Hall. Seattle Center and Experience Music Project Museum are also within 10 minutes. What are the best deals on 4-Star Hotels in Seattle? Seattle is full of hotels and it can be hard to narrow down where you really want to stay. Luckily, we've done that hard work for you be narrowing you from 492 hotels throughout Seattle, to the 70 4-star hotels in Seattle. Our 4-star hotels in Seattle are exactly what you need for your next family trip, romantic weekend, or solo getaway. Check out our most popular deals below. 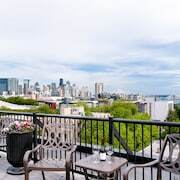 Motif Seattle: Located in Downtown Seattle, this hotel is within a 10-minute walk of 5th Avenue Theater, Pike Place Market, and Washington State Convention Center. Columbia Center and Seattle Great Wheel are also within 10 minutes. Grand Hyatt Seattle: This 30-story downtown Seattle hotel is two blocks from the upscale Pacific Place Mall and within seven blocks of cultural attractions. The hotel is adjacent to the Washington State Convention Center. Sheraton Seattle Hotel: This 35-story hotel rises above Seattle's shopping and entertainment district, within two blocks of the Paramount and 5th Avenue theaters and adjacent to the convention center. The Westin Seattle: Featuring 2 towers, this downtown hotel is 2 blocks from Pacific Place and Westlake Center shops, 5 blocks from Pike Place Market, and 1 mile from the Space Needle. What are the best activities to do in Seattle? Argosy Locks Cruise: Starting at just $53 per person. Argosy Seattle Harbor Cruise: Starting at just $34 per person. Argosy Tillicum Excursion with Traditional Northwest Meal: Starting at just $100 per person. Seattle CityPASS: 5 Must-See Museums & Attractions: Starting at just $89 per person. Best hotel i have ever stayed. Nice a d clean. Customer service was excellent. It was so cute! I loved the bright colors of the lobby and accents in the room! Free yummy cupcakes after 4! The beds were extremely comfy and had your own soft white clean down comforter! Each bed had two! This means one for each person! The extra roll of toilet paper was wrapped like a pineapple! Humongous tv! Pool was small but perfect for my kids! They even have an everything button you push on the phone when you need help! They answer it right away and are super cheerful and nice! Perfect hotel for my family! We will come again! It didn't seem to matter what time of the day or night, the staff were all very pleasant and informative. They could accurately predict my needs and offered ideas for me to consider. They made my life easier and more pleasant. I will be using them again!